Happy spring everyone! Things have been majorly busy around here, but I wanted to "hop" in and share some of the spring fun we've been having! The kids have been having a blast with our Easter centers, crafts, writing activities, and bunny math! Check them out in action! I've also got a new product and lots of freebies for you! Addition Egg-Spert - We pick two eggs, add the jellybeans inside, and write the equations. Bunny Munch Subtraction - We choose a card and model the subtraction problem using carrots. 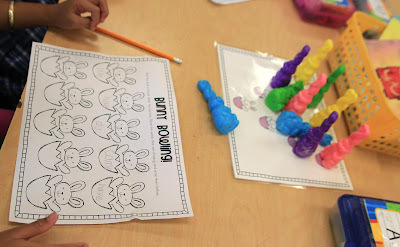 Bunny Bowling - We practice decomposing 10 by playing a game of bunny bowling. We roll the ball and then record how many pins fell and how many are standing. Scroll to the bottom for this freebie! 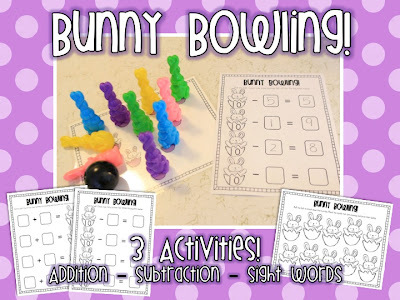 The set also includes a template for bunny bowling subtraction and sight words. I found this mini bunny bowling set at CVS a few years ago. You could also use the pink bunny eggs from Dollar Tree (see Springtime Sentences center). Or you could add some bunny ears to a regular old bowling set! Add & Cover - To play this game, we roll two dice, add the dots, and cover the sum. I found these cute egg foam shapes at the Target Dollar Spot. 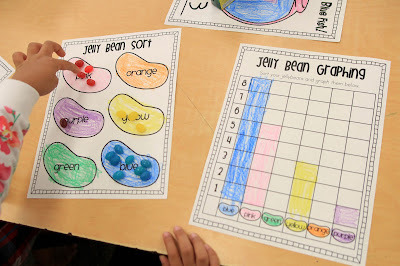 Springtime Sums - We practice decomposing 10 by choosing an egg, counting the jelly beans, and writing the equation. I usually use real jelly beans, but we have some allergies this year so no food allowed! Count the Room - We wear bunny ears and hop around the room counting pictures. Bunny ears were purchased at Dollar Tree. More or Less - We stack the cards in the middle and play this game like 'War.' We compare numerals, objects, and ten frames. Bunny Money - We crack open the eggs and count the pennies inside. Egg-Cellent Patterns - We use plastic eggs to create patterns and then color our patterns on the recording sheet. Jelly Bean Graphing - We sort and graph jellybeans. 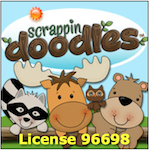 This activity is included in the free preview of my Easter Centers Pack. Click the link or scroll to the bottom to download my jellybean freebie! 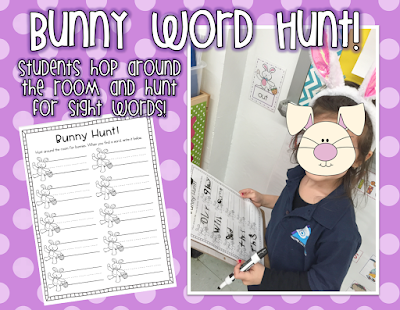 Bunny Sight Word Hunt - We hop around the room like bunnies and hunt for sight words! Syllable Stamp - We sort pictures into baskets based on the number of syllables. Then we use do-a-dot markers to stamp the syllables on our recording sheets. Bunny Hop - We wind up the bunny and watch him hop around. When the bunny stops, we read and record the word he landed on. The bunny was found at Dollar Tree. If you can't find one, you could always use a beanbag or stuffed bunny and have the kids play bunny toss! Middle Sound Egg-Spert - We sort eggs into baskets based on the middle sound in the word, then we write the words. CVC Bunny Stamp - We pick a bunny, hop the sounds in the word, and stamp the letters. Springtime Sentences - We pick a bunny, unscramble the sentence, and write it on our sheet. 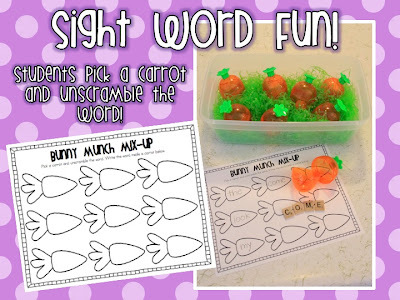 Bunny Munch Mix-Up - We pick a carrot, unscramble the sight word, and write the word. This freebie can be found at the end of this post. 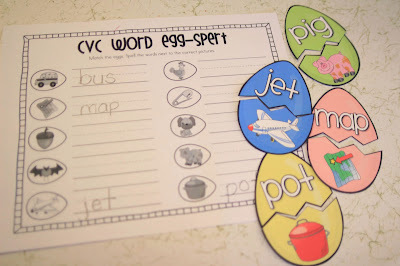 CVC Word Egg-Spert - We match the eggs and write the words. Bunny Bowling - We knock down the bunny pins and write the words on the pins that fell. Easter Egg Hunt - We pick an egg from the basket and sound out the word inside the egg. 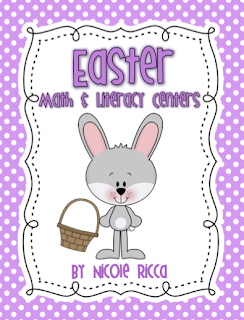 You can find all of these activities in my Easter Math & Literacy Centers Pack. The Bunny Munch Mix-Up and Bunny Bowling are not part of the pack, but you can download them for free by scrolling to the end of this post! This cute idea came from A Spoonful of Learning. We are currently working on our subtraction unit, so this was perfect! The students used props to act out subtraction word problems. One student got to be the bunny and wear the bunny ears, and the others were the carrots. The children on the rug used their own carrots to model the problem and write the equation on their white boards. I prefer to use the SmartBoard for math, so I also created a SmartBoard activity to go along with this lesson. 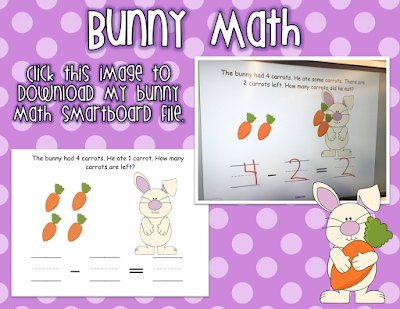 Scroll to the bottom of this post to download my SmartBoard Bunny Math Freebie! 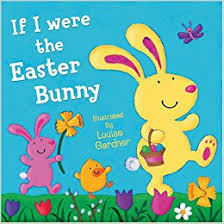 We read the book If I Were The Easter Bunny and then the kids wrote about what they would do if they were a bunny. This adorable bunny craft came from Jennifer Bates. You can find it in her TpT store. I modified it slightly to make it "If I Were a Bunny" instead of "If I Were The Easter Bunny." I think they came out pretty cute! Wishing a Happy Easter and Happy Passover to all! Enjoy your Freebies! 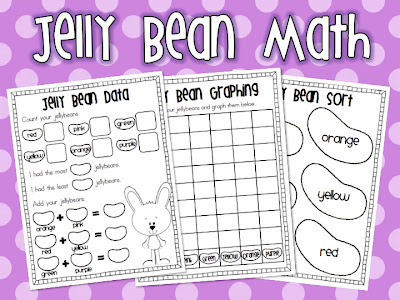 *For the jellybean graphing, click the image above to go to my store. Then download the Preview File. This activity is included in the free preview.